Welcome to Cost Per Wear, a series in which we break down how much value really lies in certain items so you can make well-informed shopping choices. Given the many outfit ideas we have saved for each item, we've calculated the cost per wear for every time we'll step out in the piece (given that we copy each of the following outfit ideas, of course). It's official: Spring is here. It's time to congratulate yourself on making it through (a particularly brutal) winter by burying away your puffer coats, wool sweaters, and heavy boots. While you're definitely shedding a few layers, it might not immediately be the moment to break out your warm-weather wardrobe quite yet, either. If this in-between weather has you seriously confused and questioning what to wear in spring, don't stress, because we have your back there. 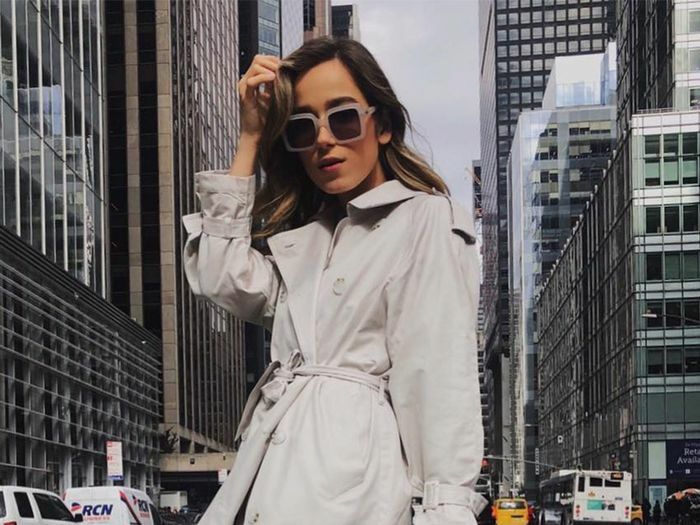 We've identified three key pieces that will pull their weight in your wardrobe during these in-between months—the trench coat, the slip skirt, and the spring-friendly white ankle boot. Below, you can get inspired by all the different ways to wear each piece in any kind of weather. Bundled with multiple layers? Worn with sunglasses and sandals? These three pieces can do it all. Once you're good and inspired, shop our pick of each item. Why it's worth it: Before you file trench coats under "rain-only gear," think again. A lightweight trench coat, especially one in a neutral like beige or camel, can take you from the chilliest of winter temps to the sunniest of spring days. Yes, it's really that versatile. As you'll see in the below outfit shots, it's all in the layering. Why it's worth it: There are few other fashion items that are just as easily styled with a graphic T-shirt as they are with heels and a blazer (and really anything in between). With so many outfit choices and occasions to wear one, a printed slip skirt is bound to start paying for itself soon enough. Why it's worth it: Sure, you own a million pairs of black ankle boots, but you might be feeling tired of them now that spring dressing has ushered in a lighter color palette. Reach for a white pair instead that will instantly brighten up whatever you wear it with, be it jeans and a sweater or a flirty sundress. Next, see which four trends have already won spring 2019.